Is This 2009 or WHAT? In this day and age, racism and ugly stereotypes continue to rear its ugly head. The recent Gates case, the Boston police officer calling Gates a “banana eating jungle monkey”, and others are strong examples. Racism and negative stereotypical portrayals of African Americans comes in many forms. pulled from the Greensboro store, the doll is still on sale in Winston Salem and likely in other locations. call COSTCO HQs and demand that this product be removed from their shelves without delay. It is the “Cuddle Baby” product #404860 and the corporate headquarters number is 800-7742678. 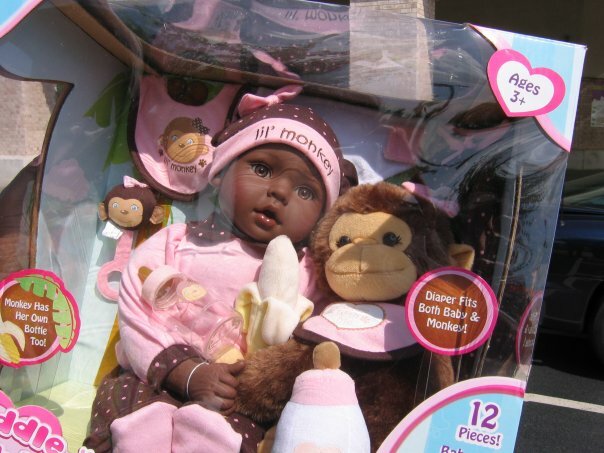 Please feel free to spread the word to your networks to contact COSTCO and demand they stop selling this doll. She could have a point, but then I am curious to know her ethnicity…yet again, it doesn’t matter. Most BLACK people don’t need to go through a step-by-step process to comprehend the offensiveness. It’s instant. When in the history of racism, there have been certain images and stereotypes linked to our appearance, one doesn’t need to “feel” ugly to see the ugliness in something like this. Some things just need more careful consideration and research when being marketed to a country where the history of slavery and racism doesn’t always quite feel like history. From now on companies should have that ONE token Black dude or chick from the mail dept. to come up and give their opinion. If they’d asked someone from the streets…they would’ve known better. Do you want to know what is funny ironic…not funny comedic? When I was pushing opinion on the watermelon soda and fighting against it’s imagery, not the fruit…I likened it to the concept of someone throwing a banana in a black kid’s hand and inferring that the child was a monkey. That we wouldn’t stop liking bananas…just the hate behind the concept. Right about now, the thought of a banana is making me nauseous.